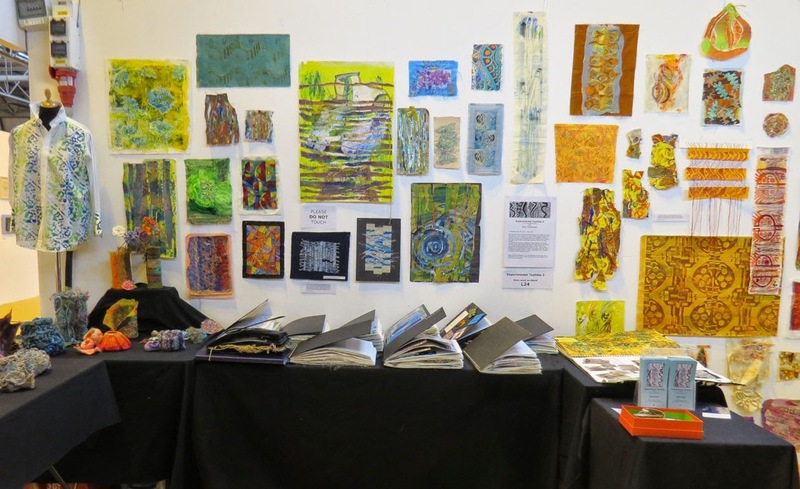 Mary Smith's interpretation of her journey in colour and in fabric. 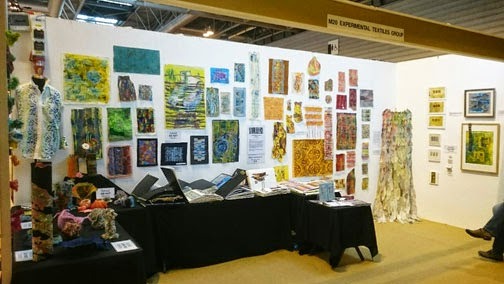 So - here we are the NEC for Fashion, Embroidery & Stitch. It is my biggest show of the year. It is a very exciting show, so much to see and do. 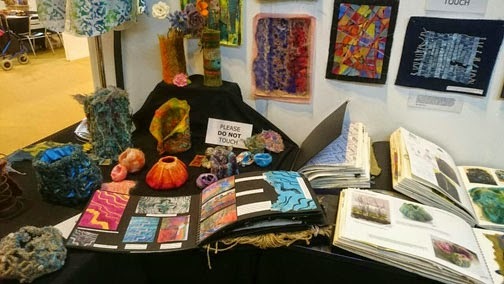 This is a quick post just to talk about my Experimental Textiles students end of year show. There are 2 stands at the show. Having sorted most of the work on the students last session in the IDC studios at The Old Needleworks, I knew roughly what I wanted to hang on each stand. Arriving and seeing an empty stand can be daunting, you just have to keep going till you finish. Starting to set up the stand. 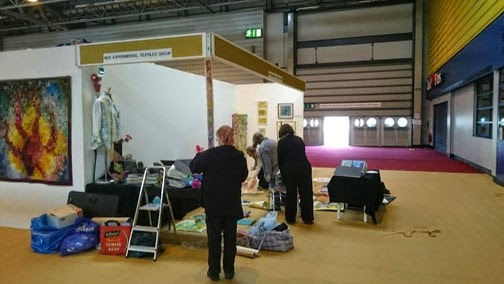 Starting to realise just how much work we have to choose from.
. . . And then, as if by magic (several hours later) - you have a finished stand. A selection of the work created on the course including some crazy 3D pieces and all the workbooks. The workbooks are always the most popular part of the stand. Some of the more resolved work that was created on the course. As the course is not accredited, the students can decide what they want to concentrate on. 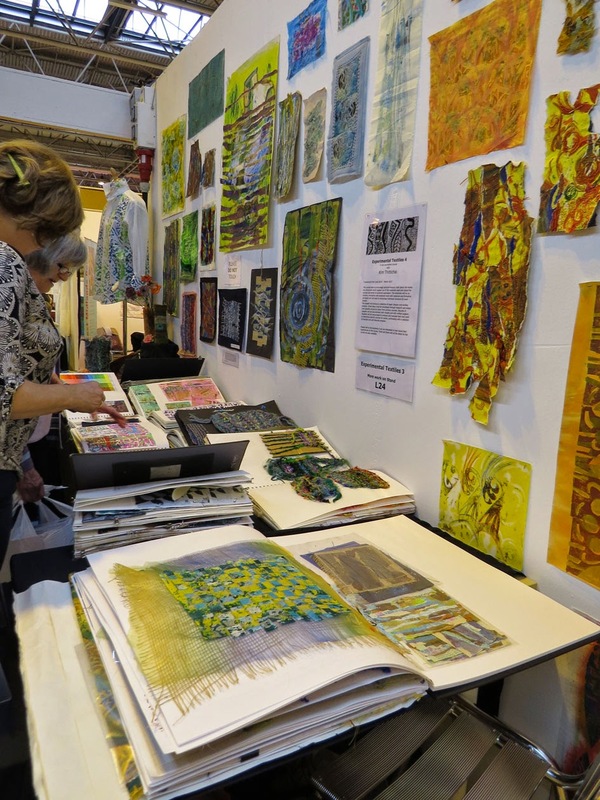 They can either work on portfolios and extensive samples or create something finished. Rachael Singleton's piece entitled 'Life Flight'. This is the main stand of the students work. 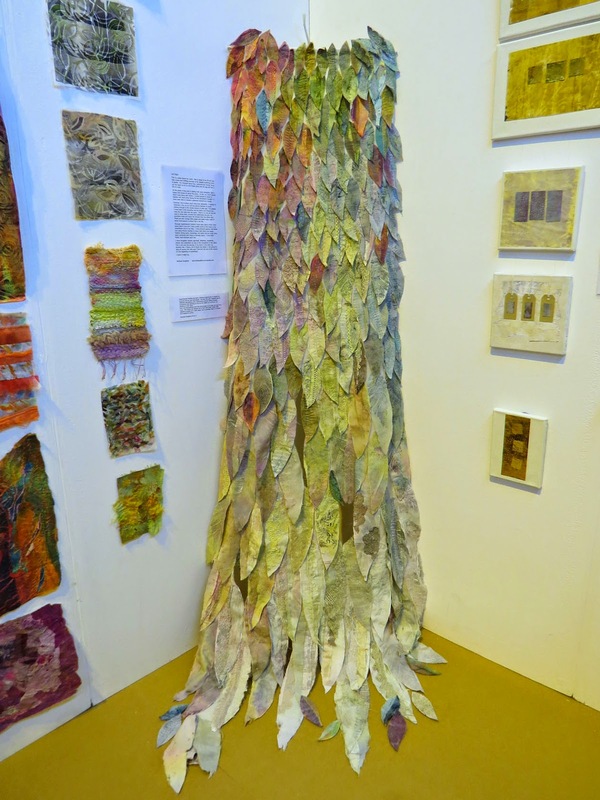 Over in the fashion show area of the hall is the 'beginnings' part of the students work. 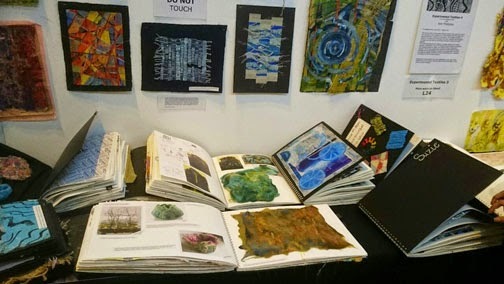 The journeys are on display here, along with Mary Smith's interpretation of her journey. 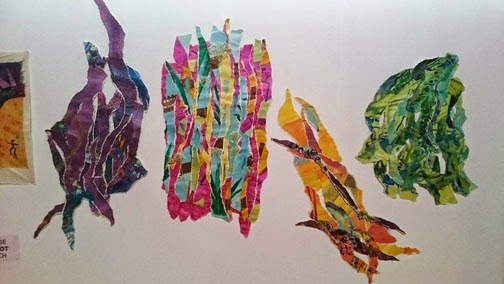 The torn and stitched exercises are there along with the dyed, pieced and stitched samples. The Journeys all lined up, they look like one piece of work. 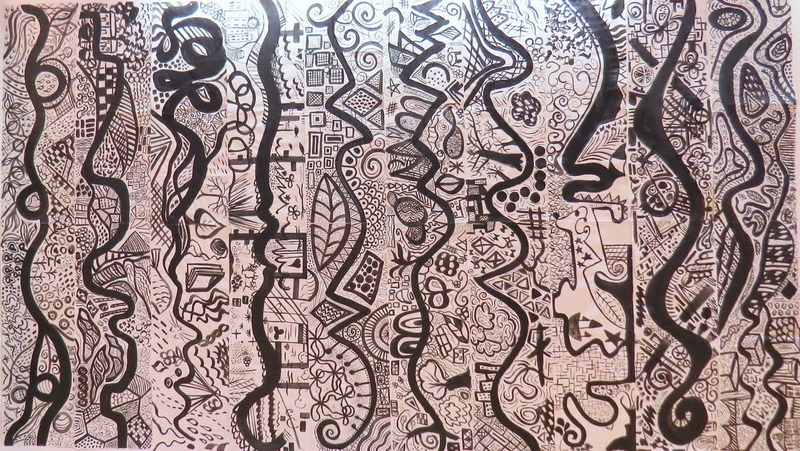 Because we just use black and white for this project it works as one piece. If we used colour it would distract from the painted marks. Mary's piece and her Journey underneath. You can see the design quite clearly. The torn and stitched papers. We have 2 more days to go - I haven't had a chance to look around yet. I hope to get 'out' over the next couple of days and take more photos. 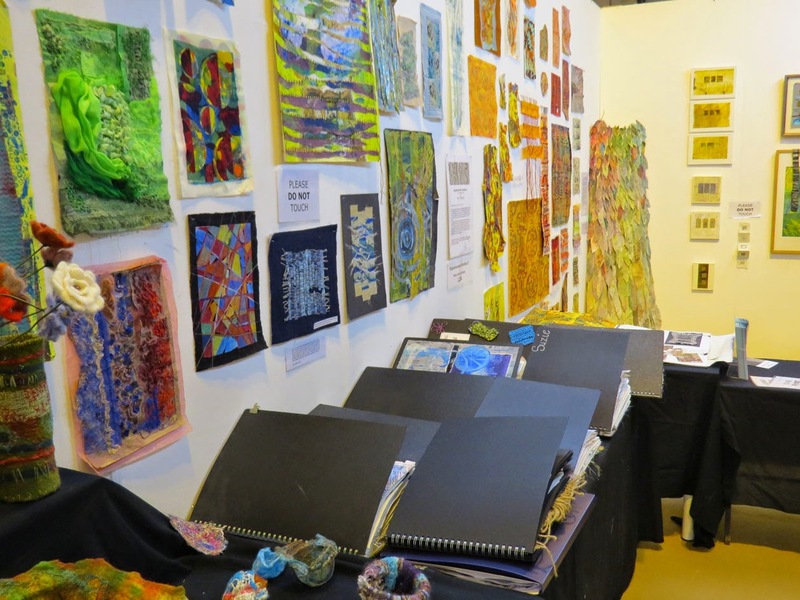 I will post more about the show on Monday or Tuesday before I head onto the next show at Excel in London next week. 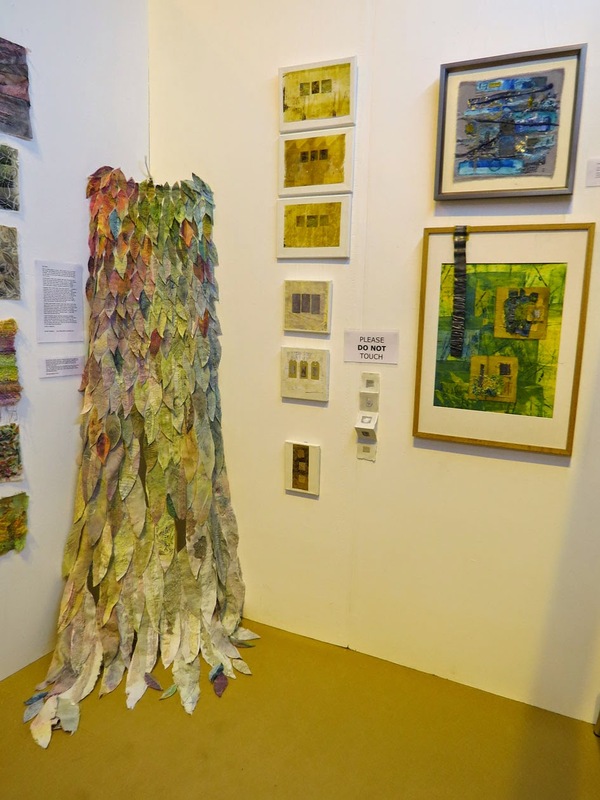 It has been great to see so many friends again at the show - including you Jill Crowther, it was also good to meet many of you that read this blog - especially you Ursula Greenwood. Off to sleep now . . . Have a great weekend, maybe see you at the show? 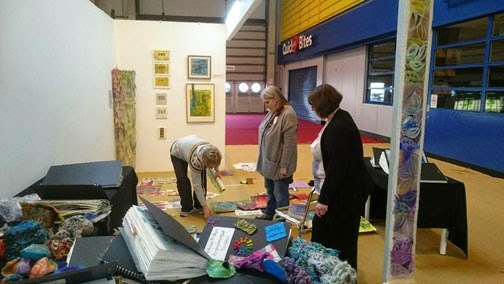 My stand number is L22 and you can see the students work on M20 and L24. It sound like a wonderful exhibit, thanks for sharing a few peeps!